A "lot more work" is required to get MPs to back Theresa May's Brexit deal, Jeremy Hunt has said, amid uncertainty over whether it will be put to a vote for a third time this week. The foreign secretary said there were "encouraging signs" that opponents of the deal were slowly coming round. But he said another vote would only be held before Thursday's EU summit if ministers were "confident" of victory. A number of Brexiteers have signalled they will continue to oppose the deal. Former foreign secretary Boris Johnson called for further changes to the terms of withdrawal, which the EU has rejected, while 22 Tory MPs have written to the Daily Telegraph saying that leaving without any agreement - known as a no-deal exit - on 29 March would actually be a "good deal" for the UK. Although the PM's plan is expected to be voted on for a third time in the coming days, the BBC's political editor Laura Kuenssberg said the situation remained highly unpredictable. She said it was "eminently feasible" the PM would delay a vote until after Thursday's summit - at which European leaders will discuss a UK request to extend the Brexit process and delay the UK's departure. Last week, MPs rejected Theresa May's deal for a second time - this time by 149 votes - and then backed plans to rule out leaving the EU without a deal. They also voted in favour of an extension to the process - either until 30 June, if the deal is supported before 20 March; or a longer one that could include taking part in European elections if MPs reject her plan again. The possibility of Brexit being delayed or overturned in another referendum has seen some MPs reluctantly back Mrs May's deal. A group of 15 Tory MPs from Leave-backing constituencies, including former Brexit Secretary David Davis, wrote a letter urging colleagues to back the deal to ensure Brexit goes ahead. 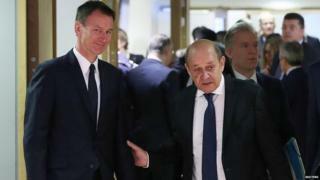 Speaking as he arrived in Brussels for a meeting of EU foreign ministers, Mr Hunt welcomed the fact "strong critics" of the deal were now prepared to support it in order to prevent the risk of "paralysis". "I think there are some cautious signs of encouragement," he said. "But there is a lot more work to do...That is why we will be redoubling our efforts this week." Asked if a third vote would definitely happen before Thursday's EU summit, he said he hoped it will but "we have to be confident we will get the numbers". Are Tory MPs changing their minds? So far the number of Tories publicly switching positions falls far short of the 75 MPs Mrs May needs to switch sides. Andrea Jenkyns told BBC News she was a "conviction politician...and would not be bullied into backing the deal" while Lee Rowley told Politics Live he could not support the deal as it stood as a "matter of principle". Writing in his weekly Daily Telegraph column, Mr Johnson warned the UK would be "humiliated" if there was not a radical change of approach. Jacob Rees-Mogg, chair of the European Research Group of Tory Brexiteers, said he was "waiting to see" whether the Democratic Unionists would swing round behind the deal before deciding which way to vote. But he said he still believed leaving without any agreement was the "best option", telling LBC "it means... we will have restored our nation's independence". Senior ministers have indicated the support of the DUP's 10 MPs, whose votes prop up the Conservative government, remains crucial. No 10 confirmed negotiations with the DUP were continuing, including over the question of how the Northern Ireland Assembly could block any new regulatory barriers to trade with the rest of the UK. DUP MLA Jim Wells told BBC Radio 4's Today the party still had a "huge difficulty" with the existing backstop arrangements - designed to prevent a hard border on the island of Ireland but which opponents say will separate Northern Ireland from the rest of the UK. He said: "We could find ourselves locked in there forever in effect - and once you get in, you can never get out." With UK politics mired in a fog of confusion, the only thing the EU can control this week is choreography at their leaders' summit. On Monday, he's in Berlin and Paris - capitals of the EU superpowers, Germany and France. But when it comes to an extension, any of the EU's 27 leaders has a veto. The decision must be unanimous. This conjures up horror visions in EU leaders' minds over being held to ransom by one of their ranks keen to use this leverage over Brexit to win a concession from Brussels over a separate issue.